Other Comments: The Hoo Doo Soul Band, while primarily a cover band, is renowned for putting their own twist on standards, and introducing audiences to funky new gems. 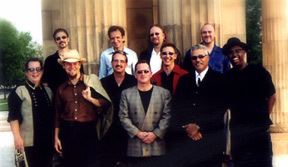 The band was started as a side project by several seasoned veterans of the Columbus music scene, who wanted an outlet for playing Funk and Rhythm & Blues. In January 1995, they began a weekly Sunday night engagement at Oldfield's on High. The Hoo Doo Soul Band quickly became “the band to hear,” and seven years later, things show no sign of slowing down. This exciting group has opened for many well known national artists, including James Brown and Ray Charles. They received the Columbus Music Awards’ “Best Cover Band” award in 1999, and “Best Live Performance” in 2000.